A horse trained on leg cues and weight distribution in the saddle can perform several moves without the use of reins. Western pleasure, English riding and trail riding as well as rodeo performances attain fluidity when the rider and horse are synchronized and move as one. Whether you have a new horse trained in this manner and he teaches you the cues, or you are training a new horse to respond, riding reinless offers rewards. Saddle your horse and mount him. As soon as you are in the saddle, stand up in both stirrups and position the saddle horn in the center of your horse’s neck. Saddles tend to tip slightly to the opposite side of the mounting side. You weight distribution needs to be centered on the horse for him to understand cues and ride without reins. Move your knees outward slightly so they do not contact your horse. Tilt your calves inward to make contact with your horse and tap him or squeeze him slightly to move forward. Release the pressure as soon as he moves forward. Go forward from a standstill or to increase forward speed to a faster gait with this motion. Keep your weight evenly distributed in the center of the saddle to go forward. Move your legs slightly back of the stirrup position and apply equal soft pressure with both knees to stop your horse. This command should stop him from any gait. This leg position moves your weight forward in the saddle to cue a stop. Slide both legs slightly forward in the stirrups and apply knee and some calf pressure to ask your horse to walk backwards. This position shifts your weight to the rear of the saddle. 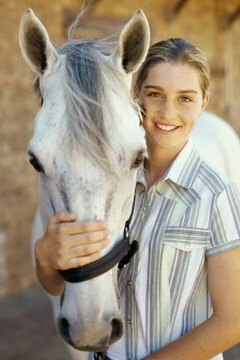 Turn your horse to the left by applying only the right leg in a slight forward position. Turn right by applying your left leg slightly forward with no contact with your inside leg. The inside leg is the direction you wish to turn. The outside leg applies pressure to turn in the opposite direction and shifts your weight in the saddle to this leg. Horses move off, or away, from pressure in a turn. Remove the pressure to stop a turn or keep your pressure in the same area to pivot in circles. Perform a side pass by sitting centered in the saddle and moving the outside leg back to the center of your horse’s barrel. Apply slight pressure with the outside calf to cue him to walk to the side in a straight line.  Practice the riding cues in short sessions with your horse. If he is trained in reinless riding, he may only require a slight bump to perform. If your horse has had minimal training, apply increasing speed of bumping him or an increase in steady pressure until he responds.  Train a horse to respond to leg and weight distribution cues while using the reins and voice commands to help him understand. Reward him with praise and petting when he responds correctly to reinforce positive behavior. Natural Horse Training: Horse Problem-Leg Cues-How do you Teach a Horse to Move Off With Your Legs from Saddle?